We model the natural-looking volume of fluids from sparse multi-view images (e.g., only a single-view (left) or a pair of front and side views (right)). We create the production-ready fluid animation using a volume sequence of fluids modeled from sparse multi-view videos. A fluid simulator allows users to further edit the appearance, behaviour, and shape of fluids (e.g., adding more turbulence (left)). We propose a method of three-dimensional (3D) modeling of volumetric fluid phenomena from sparse multi-view images (e.g., only a single-view input or a pair of front- and side-view inputs). The volume determined from such sparse inputs using previous methods appears blurry and unnatural with novel views; however, our method preserves the appearance of novel viewing angles by transferring the appearance information from input images to novel viewing angles. For appearance information, we use histograms of image intensities and steerable coefficients. We formulate the volume modeling as an energy minimization problem with statistical hard constraints, which is solved using an expectation maximization (EM)-like iterative algorithm. Our algorithm begins with a rough estimate of the initial volume modeled from the input images, followed by an iterative process whereby we first render the images of the current volume with novel viewing angles. Then, we modify the rendered images by transferring the appearance information from the input images, and we thereafter model the improved volume based on the modified images. We iterate these operations until the volume converges. 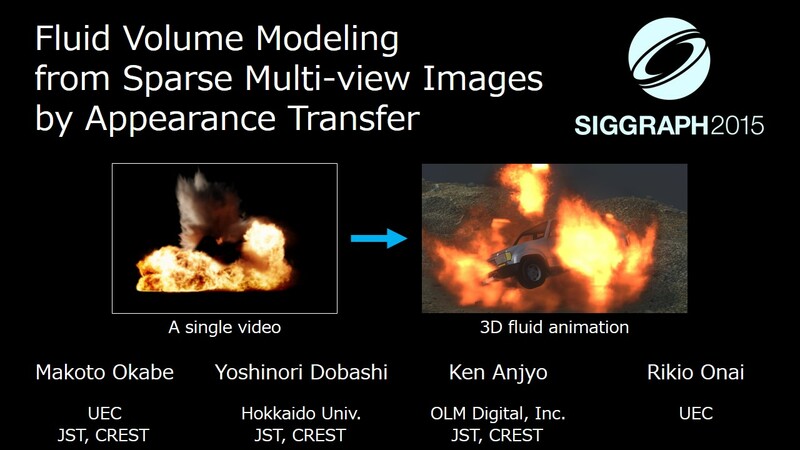 We demonstrate our method successfully provides natural-looking volume sequences of fluids (i.e., fire, smoke, explosions, and a water splash) from sparse multi-view videos. To create production-ready fluid animations, we further propose a method of rendering and editing fluids using a commercially available fluid simulator. Makoto Okabe, Yoshinori Dobashi, Ken Anjyo, Rikio Onai, "Fluid Volume Modeling from Sparse Multi-view Images by Appearance Transfer", ACM Transactions on Graphics (Proc. 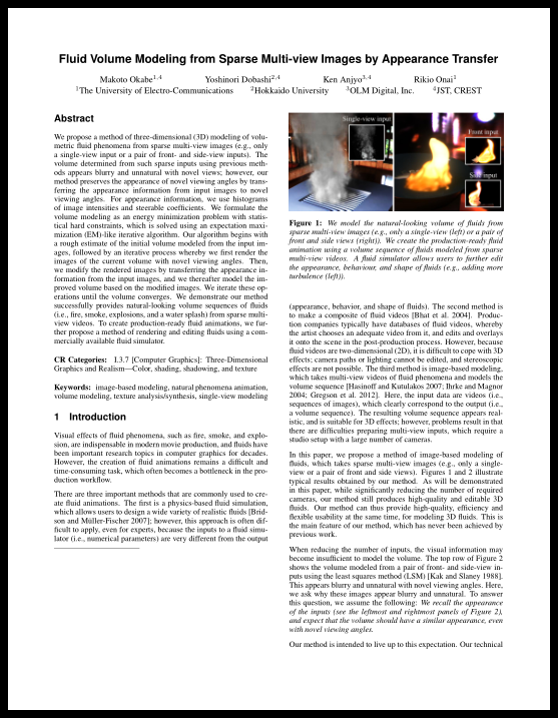 SIGGRAPH 2015), volume 34, number 4, pp. 93:1-93:10. We would like to thank the anonymous reviewers for their insightful and constructive comments. Many thanks also go to Hiroyuki Ochiai, Keisuke Mizutani, Takatsugu Yamaguchi, and Ayumi Kimura for discussions and encouragements. This work was supported by Japan Science and Technology Agency, CREST, and JSPS Grant-in-Aid for Young Scientists (B) Grant Number 25730071. This work was partially supported by the Joint Research Program (Short-term Collaborative Research) of the Institute of Mathematics for Industry, Kyushu University. Yoshinori Dobashi was partially supported by UEI Research.